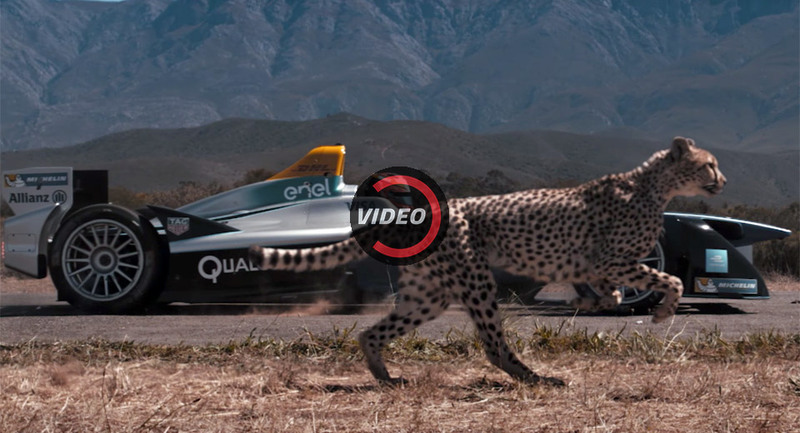 Home > video > What's Faster: An Electric Racing Car Or A Cheetah? What's Faster: An Electric Racing Car Or A Cheetah? Most of the drag races we see on a regular basis take place between two cars. Maybe a car and a motorcycle, or even a car and an aircraft of some sort. But this is something else entirely. Released by the organizers of the FIA Formula E Championship, the video pits an all-electric single-seat racer against a cheetah. Not the progenitor of the Lamborghini LM002, not some Cobra-killing Corvette, but an actual cheetah. As in, the fast-running big cat. As the video points out, a cheetah in its prime is capable of accelerating to 62 miles per hour about as fast as a Formula E racer. Not one belonging to Jaguar Racing, which would be apt enough, but to the aptly named Techeetah team for which former F1 driver Jean-Eric Vergne – winner of the last race in Montreal – drove this past season and will again the next. Now having watched the clip, we have our doubts that the race actually took place as depicted. It's probably the result of some clever splicing of footage between the wildcat and the racecar. But it's a fun exercise to watch just the same.